"Business Council of Australia chief executive Jennifer Westacott says she gets 'depressed' at business bashing because the jobs of millions of Australians depend on having profitable companies." Seemingly the Business Council's chief executive doesn't understand how a free-enterprise capitalist economy works. The principle is simple enough. If you have a dairy farm where 80 percent of the herd contributes 99 percent of the return that covers the cost of running the farm and the upkeep to maintain its productivity, then the fastest and most effective method to raise the farm's economic performance is to cull the 20 percent of the herd that is barely contributing at all. That 20 percent to be culled eats the same per head as the rest of the herd. Each cow drinks the same amount of water and uses the same amount of labour and energy to care for it. 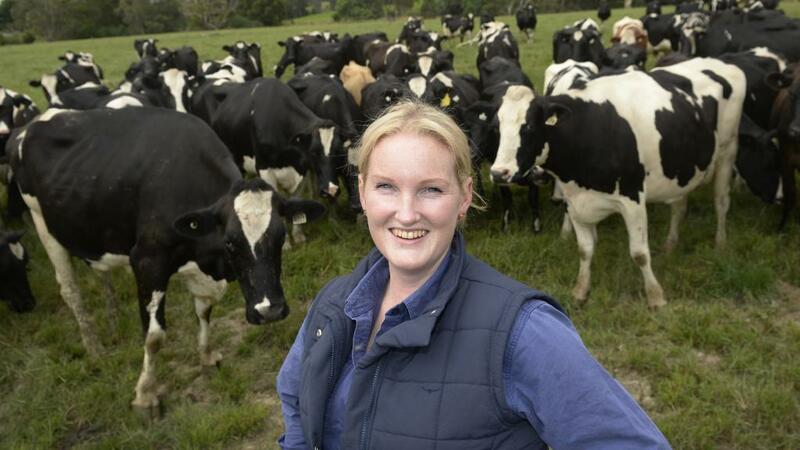 As a farmer you may even know all of your cows by name and love them all equally. But there is no room for sentimentality in a free-market capitalist economy. The 20 percent of Australian businesses that year after year fail to make a profit and pay no tax towards the maintenance of Australia's infrastructure and the skills of its workforce are dragging down the performance of the whole economy. Without them the 80 percent of businesses that are productive and making a contribution will be able to expand and the whole economy will advance quickly. There may even be the capacity to reduce taxation that is required to maintain and expand the economy's productive capacity. The death of the car industry and the closure since 2000 of four of the last eight Australian oil refineries pulls at the heart-strings of many. The Business Council of Australia should know better than to be so sentimental. The Business Council of Australia likes part of the story of Incitec Pivot, a company that invested in the US. Here's an Orica factory which is one of the many profitable Australian businesses the Business Council of Australia doesn't like to mention. The BCA must be denigrating Australian investment opportunities to lobby for a corporate tax cut. The NSW Department of Planning has approved Orica’s proposal to increase the levels of ammonia at its Kooragang Island facility. Incitec Pivot has credited the boom in US shale gas as a factor in its decision to build a new ammonia factory in Louisiana. Incitec, which makes fertiliser and explosives for the agriculture and mining industries, is a heavy user of gas, and its CEO, James Fazzino, a critic of Australia’s unrestricted approach to gas exports. "'[The plant] takes our North American business and any future expansions back to US gas economics," said Fazzino in a statement. "This is vital to this project because 80 per cent of the cost of making ammonia is gas." Incitec Pivot, through its subsidiary Dyno Nobel, constructed its seventh ammonia plant at Cornerstone’s Fortier Manufacturing Complex in Jefferson Parish, Louisiana, US. The project was implemented in conjunction with the maintenance, upgrades and infrastructure expansion for Cornerstone’s complex. With a production capacity of 800,000t a year, the ammonia plant began its operations in October 2016. The feasibility studies for the project commenced in May 2012 and construction works commenced in May 2013. The new ammonia plant was constructed on a brownfield site at Fortier Manufacturing Complex in Waggaman, Louisiana, on the west bank of the Mississippi River. It is located on the site of a former ammonia plant, which was closed down more than a decade ago. The Business Council of Australia copied the entire following article onto its web site from the Australia Financial Review. Making a 'poster-child' of a business investing in the US and not mentioning a successful competitor, Orica, that invests in Australia looks like it is engaging in bashing Australian business. This opinion article by Incitec Pivot chief executive James Fazzino was published in The Australian Financial Review on 4 September 2017. With a dramatic sweep of his hand, the then-governor of Louisiana, Bobby Jindal, proudly embraced the numerous manufacturing plants visible from the window of his office. I will long remember the day that I made an impromptu contact with his office on the way to New Orleans where this obscure Australian company, Incitec Pivot Limited, was considering an $US850 million ($1.08 billion) investment in a world-scale ammonia plant. He cleared his diary to meet with me. Statistically, there is much to recommend the US as a great place to do business: it is the world's largest economy and second largest manufacturer, with high levels of research, capital investment and productivity. These numbers help explain why the United States has been the largest destination for Australian investment for many years, as confirmed by the recently-released US Studies Centre report on the US-Australia investment relationship. However, numbers alone don't capture what is to me a key attraction for US investment – and an area where Australia could learn significantly: a strong supportive business-friendly culture. As the report details, Australian businesses like us who enter the United States receive a level of welcome that is rarely found in Australia. Our experience in Louisiana is a testament to this: One of Jindal's initial comments to me about why he was focused on supporting project development particularly stood out: "I'm not about more taxes; I'm about more taxpayers". This approach extended throughout his administration. It was essential to our project economics that the approvals process was expedited – not the standards lessened – so we could sign a lump-sum construction contract. Louisiana has environmental and regulatory standards the equal, if not higher, than Australia and yet we achieved approval in six months. Meanwhile, the US Studies report details how it took years for a simple retailer like Costco to get the zoning approval to open their first warehouse in Victoria. The state government agency charged with encouraging business into the state is called Louisiana Economic Development (LED). When we discussed with LED the need to expedite the approval deadlines, the response was that "we won't lower the standards but we can have our people work overtime to ensure that all the documentation achieves the necessary quality … if you pay for the overtime". Of course, we agreed. With LED, we were never forgotten after we began the process of building our plant. They contacted us regularly asking: "Is there any more that we can do to help further?" That's a business-friendly partner. This level of commitment to a mutually-beneficial outcome extended to all levels of government from the state to the local. The Louisiana project was an outstanding investment for IPL and was recognised as such by an international management consultancy, which benchmarked the project in the top 2 per cent of global construction projects for delivery on time and under budget – and most importantly, with zero lost time injuries. Sadly for Australia, we looked at a similar development at the same time in New South Wales that did not end up proceeding. Like other case studies of Australian firms detailed in the US Studies Centre report, the case for making such a sizeable investment in the United States was incontrovertible when compared with the same option in Australia. Let me give you three simple examples for why. Bureaucracy: The US Studies report details the lengthy regulatory process companies face in Australia and our experience is no different. The approvals process for our Australian project took some three years – about the same time that it took to construct the entire project in Louisiana. Our US plant was producing when we would have just started turning the first sod in Australia. Workplace productivity: the cost to construct the project in Australia would have been 40 to 50 per cent more than what our Louisiana plant cost us. Energy: To manufacture ammonia – and many commonly-used plastics and chemicals – gas is used as a raw material, in the same way as iron ore for the manufacture of steel. The competitive price of gas was a critical decision point for the Louisiana project. The US has a gas price of about $US3 per gigajoule, partly as a result of federal government policy. In Australia, previous Australian federal and state governments have allowed unfettered exports from the East Coast and the price of gas is as high as $20 for some industrial users; as well as adding $300 to $400 to some household energy bills. To his credit, Prime Minister Turnbull has regulated to ensure domestic supply is protected in balance with exports. While the United States has taken time to recover from the global financial crisis and there are some current headwinds, I'm confident about the outlook for the US economy. There are predictions by many that the Chinese ascendancy is close. I have no doubt that will eventually happen – sooner or later. However, I have a soft spot for the United States and believe that their business-friendly culture will always provide that competitive edge. After all, it's a great place to do business. James Fazzino is managing director and chief executive of Incitec Pivot Limited and adjunct professor to La Trobe Business School. The next generation of downstream processing has arrived in the resource rich Pilbara region of Western Australia with the official opening of the Yara Pilbara Nitrates technical ammonium nitrate (TAN) manufacturing plant. The plant, developed in joint venture by Orica Limited and Yara International ASA, will have capacity to produce 330,000 tonnes of ammonium nitrate (AN) per annum. Ammonium nitrate is the main component of explosives used in the mining, quarrying and construction industries. The plant is currently in the commissioning phase and is expected to be operational by the end of 2016. The Orica and Yara joint venture facility was opened today by Western Australian Premier Colin Barnett at a ceremony marking the completion of the plant construction phase. The plant is fully integrated with the neighbouring Yara Pilbara Fertilisers ammonia plant, which exports 800,000 tonnes of ammonia per annum to world markets. Grain and cotton growers across NSW and Queensland are set to benefit as Orica launches its new fertiliser business with plans for a local manufacturing plant for urea ammonium nitrate (UAN) in Moree, NSW. Orica Agriculture also expects to begin supply of anhydrous ammonia to east coast growers in April next year, with dedicated line haul and on-farm nurse tank fleets. Construction of the UAN plant is scheduled to commence in 2018, but growers can access transported UAN immediately. These investments will bring increased competition, as well as secure and consistent supply of liquid and gas nitrogen fertiliser, to growers on the east coast of Australia. Orica Agriculture Senior Business Manager, Paul Scutt, says liquid fertiliser is a speciality product used with great success in Western Australia and other markets globally and there is growing interest in the eastern States. “We believe the market is ready to embrace the benefits of UAN including precision application during specific crop growth stages, reducing passes over paddocks and the reliance on pending rainfall for incorporation of fertiliser. Orica appears to have snatched more business from rival explosives manufacturer Incitec Pivot, after Gina Rinehart's Roy Hill indicated it would not renew Incitec's contract to supply explosives when it expires next month. Roy Hill's decision comes barely one month after BHP confirmed it would not renew Incitec's contract to supply ammonium nitrate prill to BHP's West Australian iron ore division when the contract expires in November 2019. Loss of the BHP contract will deliver a combined $35 million hit to Incitec's net profits over the 2020 and 2021 financial years, and Incitec said this week the loss of the Roy Hill contract would deliver a further $81 million hit to net profits after tax over the next five years. RELATED STORY: Verrender: Who really wins in the murky world of corporate tax cuts? RELATED STORY: Trump just promised huge tax cuts. But will they ever become a reality? There is no compelling evidence that giving the country's biggest companies a tax cut sees that money passed on to workers in the form of higher wages. Treasury modelling relies on theories that belie the reality that's playing out around the world. Since the peak of the commodities boom in 2011-12, profit margins have risen to levels not seen since the early 2000s but wages growth has been slower than at any time since the 1960s. It's also disingenuous to talk about a 30 per cent rate when so few companies pay anything like that thanks to tax legislation that allows them to avoid paying corporate tax. Exclusive analysis released by ABC today reveals one in five of Australia's top companies has paid zero tax for the past three years. And while the Treasurer and Finance Minister warn that Australia's relatively high headline corporate tax rate means Australia remains uncompetitive and companies will choose to invest in lower taxing countries, the facts don't bear that out. Business investment in Australia has been at historically high levels over much of the past decade despite our comparatively high headline corporate tax rate. Before Donald Trump cut the US corporate tax rate earlier this year, it was 5 to 9 percentage pointshigher than Australia's. That hasn't deterred Australian companies from seeking opportunities in America instead of Ireland, where the corporate tax rate is less than half ours (12.5 per cent), or Singapore (17 per cent). In truth, businesses make decisions about where in the world to park their money based on myriad reasons, possibly least of which is the headline corporate tax rate. Will I be closer to my main customers? Where is the best talent located? What are the labour costs? How onerous are the regulatory hurdles to investment? Is the culture and language easy to navigate? Is the country politically stable and is there respect for the rule of law? When Incitec Pivot chose to build a $1 billion factory in Louisiana rather than Australia, it did so due to America's strong productivity levels and its speedy approvals processes. Tax was insignificant on the pros and cons list. 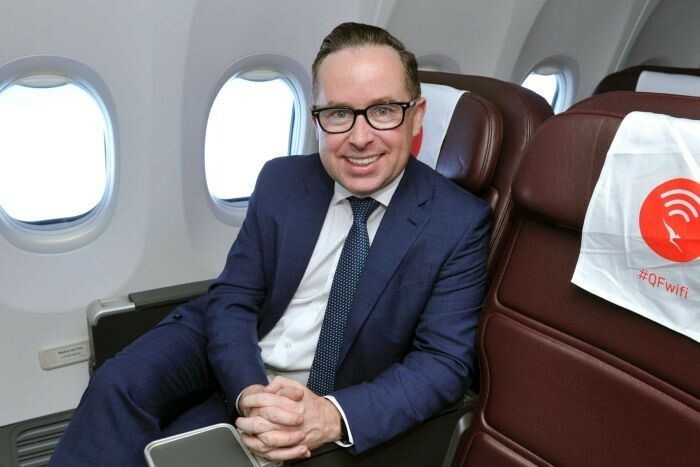 High-profile chief executives like Qantas chief Alan Joyce are adamant that investment decisions rest largely on the rate of a country's corporate tax. But it's hard to see how a lower tax rate is an incentive for investment when one in five of our biggest companies haven't paid any corporate tax at all in at least three years. Qantas is about to clock its 10th year tax free. 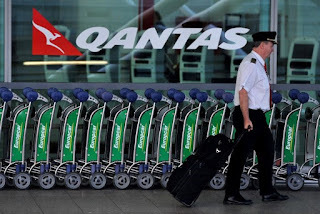 Qantas won't pay tax again until its profits exceed the tax losses recorded since 2010. Only when all the accumulated losses are offset will a lower tax rate mean a higher cash flow. Besides, regardless of where the corporate tax rate sits, the airline has already indicated an intention to invest $3 billion across 2018 and 2019. The overwhelming benefit of higher profits flows to shareholders. A zero corporate tax bill at Qantas has certainly seen one significant wage rise at the company — the chief executive's. The benefit to workers has been less pronounced. According to the Australian Services Union, representing just under half of all Qantas workers, the average pay rises for staff since the airline has returned to profitability have barely kept pace with inflation. Alan Joyce, on the other hand, has seen his total salary close to double from $12.9 million in 2016 to $24.6 million last year thanks to a huge jump in the value of shares provided as part of a bonus scheme. "While Qantas workers have seen pay rises of less than 3 per cent on average over the past decade, we've seen the CEO's salary balloon to almost $100,000 a day — much more than most workers earn in a year. It doesn't trickle down — it trickles up, and the rules need to change to give workers a better deal in this country." When drawing comparisons with experiences in other countries, Canada provides a good like for like profile. Australia and Canada share a similar history and are both resource rich economies. Our financial and political systems are also on par. Canada cut its corporate tax rate from 42.4 per cent in 2000 to about 26 per cent in 2011, where it has remained. In 2000, Australia cut its corporate tax rate from 34 per cent to its present 30 per cent. 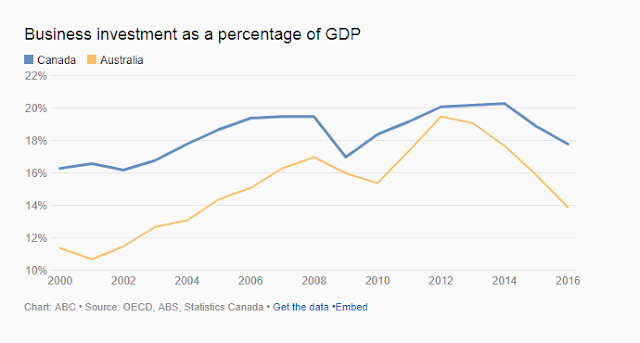 Business investment rose in both countries during the mining boom but it rose more in Australia, despite a corporate tax rate that's four percentage points higher than Canada's. "It can be argued that the mining investment boom was bigger in Australia than Canada but now that it's over in both countries, it's worth noting that business investment as a share of GDP was 2.4 per cent higher in Australia in 2016 than in 2000, as against only 1.5 per cent higher in Canada, despite Canada's massive cut in company tax." It is also worth noting that wages have risen by about 20 per cent more (in nominal terms) in Australia than in Canada since 2000, despite Canadian companies having had a much bigger corporate tax cut. 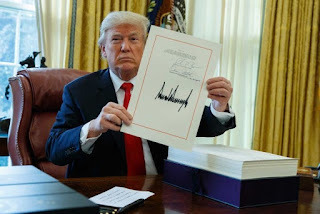 The White House claims the recently legislated cut in the US corporate tax rate will translate to higher wages for the average worker of between $4,000 and $9,000 a year, but there is no credible evidence to support that boast. In fact, the opposite has been true in practice when you compare business activity in Britain and America. Between 2006 and 2013, while British businesses were paying increasingly less in tax (from 30 per cent to 19 per cent), wages went down not up. 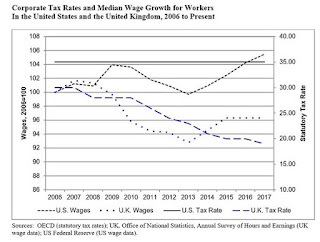 UK wages have started to grow over the past four years but at a much slower rate than in the United States where corporate tax rates had remained high. "Among other things, workers' representatives sit on the 'supervisory boards' of large German companies so there is probably a different debate within German boardrooms as to how the benefits of any cut in the corporate tax rate in Germany might be shared among employees and other stakeholders." "The issue of how the tax system affects the competitiveness of Australia as a destination for investment is one of ongoing political debate." Adding to this debate is the issue of average and effective tax rates. Effective tax rates are said to drive investment decisions and take account of what companies actually pay once deductions, depreciation and other tax minimisation strategies are considered. According to a report published last year by the US Congressional Budget Office, Australia's effective tax rate, at 10.4 per cent, is among the lowest in the world. The average rate paid by American companies in Australia is just 17 per cent. The Treasurer's office takes issues with these figures, claiming they are out of date because they are based on data from 2012. The Government prefers a study by Oxford University that puts Australia's effective average tax rate at 26.6per cent and at the higher end of the scale. "Whilst the data used in the 2017 CBO report is from 2012, it is the best analysis available and I don't believe the Australian company tax landscape has changed significantly since 2012." Dr Hamson has worked in banking and finance in Australia, as a university professor in Australia and the United States and has served on the ASX Corporate Governance Council. Regardless of which effective tax rate you prefer, both the Oxford and the CBO data demonstrate the folly of focusing exclusively on the headline corporate tax rate of 30 per cent. Do tax cuts boost investment? Chris Richardson from Deloitte Access Economics told the ABC's Q&A that there was a "consensus" from the experts about the macroeconomic benefits of a corporate tax cut. 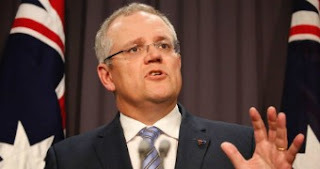 He said the cut represented $20 billion a year in growth for the Australian economy with two out of every three dollars showing up as higher wages. Those figures (and experts) came from Treasury who provided modelling on behalf of the Government. Will Australia really be uncompetitive with these countries if the Government's tax cut proposal is not passed by Parliament? The numbers are based on the widely, but not universally, accepted theory that cutting the company tax rate will raise investment, which should in turn boost productivity and lift wages. Apart from the obvious point that all else is not equal in practice, not all investment boosts labour productivity. According to other Treasury-commissioned modelling, if the rate is lowered from 30 per cent to 25 per cent then gross domestic product will double by September 2038 as opposed to December 2038 without the cut. Both models predict that in 20 years' time the unemployment rate will be 5 per cent regardless of whether we spend $65 billion on company tax cuts or not. In truth, it is hard to find real-world evidence to support these economic theories, so the Government might be wise to heed the words of Plato: "A good decision is based on knowledge and not on numbers." The other issue often overlooked is the impact of Australia's dividend imputation system. Australia and New Zealand are the only two countries in the OECD that grant companies the right to attach tax credits to dividends paid out to investors. In most countries, companies pay tax and then shareholders pay tax on their dividends. Australia taxes just once. Cutting the company tax rate therefore doesn't result in a higher after-tax return on investment to Australian shareholders in Australian businesses so Treasury's theoretical model doesn't hold. Experts including economist Saul Eslake estimate that Australia's 30 per cent corporate rate with dividend imputation raises about as much tax for the government as a 20 per cent rate without dividend imputation. The principal beneficiaries of a cut in Australia's corporate tax rate are overwhelmingly foreign companies and foreign shareholders in Australian companies. There is no guarantee at all that cutting the tax they pay in Australia will lead them to increase the level of business investment in Australia. Can Australia afford to spend $65 billion? 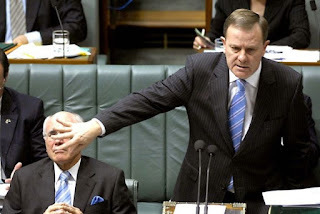 The last time a government splashed around cash in the form of tax cuts the treasurer was Peter Costello, who had no debt and no deficit to contend with, thanks to oversized profits and attendant corporate tax flowing from the mining boom. In 2018's Australia, it's hard to imagine how a government could ever again manage to give away the equivalent of Mr Costello's $170 billion worth of tax cuts while still protecting the surplus. It's been 10 years since the Australian budget was last in surplus. With a debt of more than $600 billion, many are questioning the merits of prioritising a $65 billion giveaway to big business in the form of a tax cut. "We are seeing indications that the deficit is deteriorating so it is going to be a challenge." Yet today the BCA and its high-profile members like Mr Joyce are insisting on a company tax cut that would blow a massive hole in the Government's revenues and push the budget and national debt further into the red.